NN4QQ: The Emperor Has No Clothes - More on my infatuation with coils. The Emperor Has No Clothes - More on my infatuation with coils. As you may already know, I have developed a wholesale interested in coils. 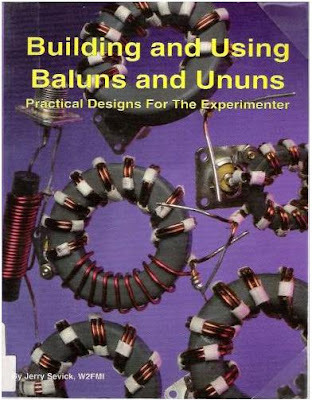 I have been trying to increase my personal understanding of coils as used for antennas (as baluns) and as they are used in band-pass-filters (ummm, as well ... coils) and all other things of an inductive nature. 20 bucks and a few days later... I wish I could tell that it were true, in short they are all wrong and I would strongly suspect not one of them actually read the book. I found the book to be at best a loosely coupled collection of articles which seems to start in the middle of basic ideas, and seem to trail on and then abruptly end. To the say the book is badly written, I will not say, I'm no English major myself, and I'll leave that to others. What I can and will say is; I did not enjoy it, and I found it to be contradictory, weak and misleading. -- In many cases the author warns the reader of the evils of voltage baluns (probably a true statement), but then extols the superb benefits and divine merits of Ruthroff's work on the same. huh?! The author constantly refers to the seminal publication of G. Guanella in the Brown Boveri Review in September of 1944 (PDF) but never really takes the time the explain to the modern reader the construction outlined in the article. The article also constantly referred to C. L. Ruthroff August 1959 equally seminal article (PDF) -- I'm sorry, I had missed that one too, as I imagine most modern readers will have (as in 'we were not born yet!?') and my subscription to the BBR is still in the mail. -- I have posted both of the articles above so that you may acquaint yourselves with their genius. Like the little boy in Hans Christian Andersen's story, "The Emperor’s New Suit". I post this rather negative review at great peril to myself, because HAMs are a funny lot (as in not "ha-ha"), and are very similar to sheep, and do not take kindly to folks having a difference of opinion on something they hold sacrosanct. Flame On QRPers! As to not become the Andy-Rooney-of-HAM-radio with my Casandra like opinions, I will share with you that I did find a few articles (Free PDF) on the web that are very helpful, and go a long way towards really being helpful. I also share with you Jim Brown's J. Brown k9YC APR-2008.pdf (PDF), but with a warning. For it also seems to suffers from Current-vs-Voltage confusion affliction -- For the record the Guanella balun is NOT a voltage balun. A bad review is just as good as a good review; with out both we have nothing to base an opinion. I was in search of information and sources for the book you nicely reviewed. I am indebted to you for providing an informative review! You also saved me $20 US. I am getting back into amateur radio after a 50 year absence - yes 50 yrs! I found the information more confusing than I would have imagined. It is apparent to me now that there is a wealth of dis-information to be had on the Internet. Every once in a while, I come upon a voice of reason such as you provided in your review of this book - thank you! More on WSPR ... Rainbows in the dark. Pssst.... Do want to know a secret? - Try WSPR!